Vineyards situation : The Côte Chalonnaise is a continuation of the Côte de Beaune, to the south of Santenay. Of the five appellations in the Côte Chalonnaise, Mercurey is the best known. Characteristics : The vineyards surround the village and face either south or east/ north east. Composition soil makes Mercurey quite similar to wines from the Côte de Beaune. There are several highly regarded « Premiers Crus ». Wine making : After a three weeks vinification in vats, the wine is aged in oak barrels during 12 to 15 months before bottling. 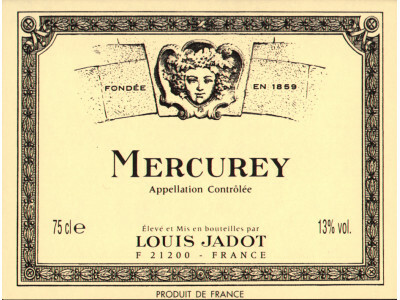 Winemaker's comments / Gastronomy : Louis Jadot Mercurey is a deeply colored, very soft wine that is medium bodied and fruity yet rich, straightforward in character, and intended for youthful. It will be an excellent partner for grilled and roast meats, meat cooked in sauce, mildly flavored game and cheeses. Preservation : It will be at its best between 5 to 8 years and must be kept in very good conditions of temperature and humidity.